The word “mustard” was originally used to describe the condiment, rather than the seed itself. 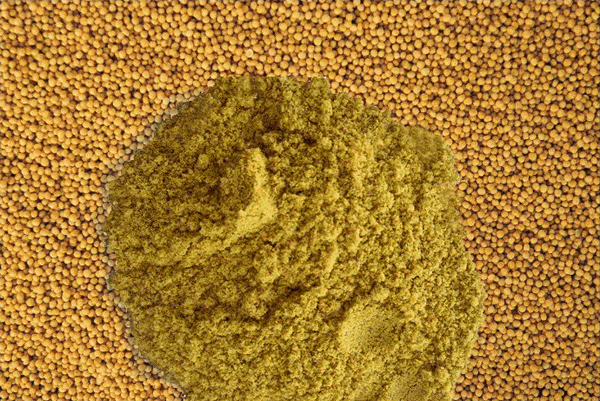 The ancient Greeks and Chinese were using prepared mustard thousands of years ago. The ground seeds were often mixed with the unfermented juice of grapes, called a ‘must‘. Today, nearly 400 million pounds of the yellow stuff is eaten worldwide each year. India is a major producer, which large tracts of mustard being cultivated in Rajasthan, Uttar Pradesh, West Bengal, Madhya Pradesh and the Punjab. Mustard seeds are mentioned in many religious texts around the world, including Vedic sastra and Jewish, Christian, and Muslim scriptures. One of the earliest references to mustard is found in a 5th century B.C. story about Gautama Buddha, who instructed a grieving mother named (Kisagotami), who had just lost her son, to visit every house in the village and collect a handful of mustard seeds from any family that had never lost a husband, parent, child or friend. When the woman could not find such a family, she understood that grief over death is shared by all, and she was relieved of her burden. Many of the references to mustard in Vaisnava sastra refer to the oil, which is favored not only for cooking, but also for massaging into the skin. In Caitanya-caritamrta Madhya lila 25.206, we read about Subuddhi Raya, who used his money to help Vaisnavas in need, particularly Bengalis visiting Mathura who became distressed by the unfamiliar diet. He would graciously provide them with rice and yoghurt to eat, and mustard oil to rub on their bodies. In Srimad Bhagavatam 3.23.32 we also read about Devahuti being adorned with various cosmetic substances. Before her bath, she was smeared with turmeric mixed with mustard seed oil. Not only does mustard help eliminate toxins from the body, it is also excellent for keeping the body warm and moist, especially in the cold of winter. But as Srila Prabhupada explains in his purport to Antya lila 12.108, oils such as mustard, ghee and flora oils are only meant to be used by grihastas. Sannyasis should not use such oils, especially perfumed oil. The benefits of mustard oil are enumerated in the Vedas, Upanishads, Charak-samhita, and other texts. Modern science is now beginning to understand and acknowledge the value of mustard oil, and consequently the commodity is more highly valued in the marketplace. Mustard oil provides good fatty acids, and helps to reduce cholesterol and heart problems, being more healthful in this regard than sunflower and other oils. Research has shown that those frying foods in mustard oil have a reduced rate of heart attack, by almost 71%. In Ayurveda, mustard seeds are recommended for digestive problems, because of the heat generated by the active ingredients. Mustard plasters are also indicated for respiratory and circulatory problems, helping to stimulate blood flow and soothe inflammation. Mustard is known to help relieve muscle and joint pain, and is a great appetite stimulator. It’s also said to be a powerful anti-microbial. When buying mustard oil for cooking, it’s common to find bottles on western grocery store shelves that say ‘for external use only’. Although the oil has been valued for cooking since ancient days in India, there now appears to be a move by west agro-interests to defame mustard oil, which is the third most-used cooking oil on the globe, competing with canola oil (favored by big agro) and palm oil. When cooking with mustard oil, it’s a common practice to heat it until it just begins to smoke. This helps to burn off some of the substance that gives it a sharp taste and smell, making the foods fried in it more palatable. 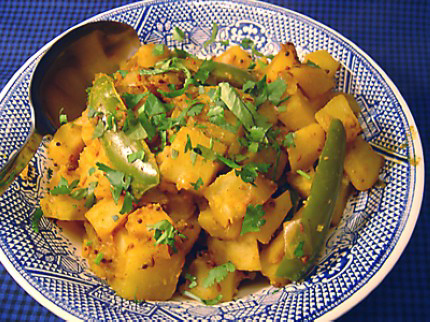 One way to enjoy the nice flavor of mustard oil is in dishes featuring potatoes. They fry up crispy and golden, and the potato takes on the full flavor of the oil. While many potato preps are seasoned with mustard seeds, here a few of our favorites that feature both seeds and oil. Peel and cube the potatoes. In the oil, fry the finely chopped fennel and green chili, then add the mustard seeds until they pop, followed by the dal and curry leaves. When all are crisped, add the potatoes, salt and turmeric. Cook on low heat with the lid on until potatoes are done. Add scant water as needed to keep from sticking. Boil the potatoes, cutting three of them into big pieces and coarsely mashing the other two. In a little hot oil fry the panch poran, chili powder, turmeric and curry leaves. Add the tomatoes, and cook, stirring often, until the liquid evaporates. Add the potatoes along with 4 cups of water, and bring to a boil. Add the salt and cilantro leaves, and let the potatoes boil for ten minutes, then offer hot with bread. Slice the kernels off the corncob. If using frozen, thaw the kernels and pat dry. Heat the oil until just smoking, then add the mustard seeds until they splutter, followed by the green chili. Fry until crisped. Add the turmeric, salt and corn. Cover and cook until the corn is tender, about 5 minutes. Stir in the cilantro, and offer. The more you cook with mustard – seeds, oil and greens – the more you come to appreciate this excellent foodstuff. So many Krsna prasad dishes are made flavorful with mustard, and the plant is so easy to grow that it’s a natural for the devotee garden. Granted, it takes a lot of mustard flowers to produce a year’s worth of seeds for cooking, but mustard will grow almost like a wild plant in many locations. When the flowers have matured and produced seed pods, the flower heads are broken off and tossed onto plastic on cloth, and left in the field for two days to dry. The seed heads are then threshed to remove the chaff, and the seeds reserved and fully cleaned, removing all the loose husks. Depending on the source of the mustard you buy, you can even use cooking seeds to grow the plants. 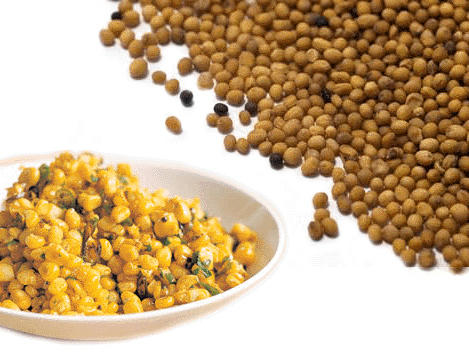 Mustard seeds germinate in three to ten days in cool, moist soil. The plants like temperate climate, but grow all across North America, Europe and India. We leave you with a final recipe, this one from Italy. 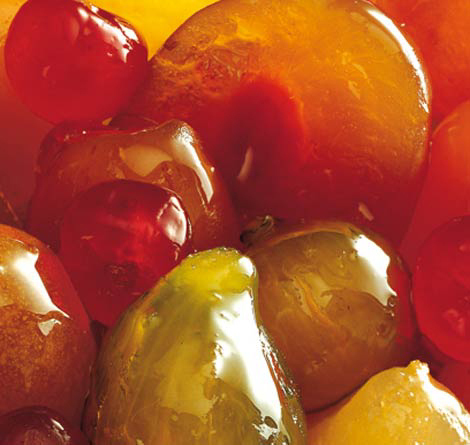 The preparation, called Mostarda di Frutta, is a beautiful way to use mustard, creating a condiment you’ll be pleased to place before Sri Krsna. Pick the finest fruits, tender and small. Many different fruits work well; the most traditional are figs, pears, cherries, apricots and pineapple. Peel those with heavier skins, then poach the whole fruits in a medium thick sugar syrup that is flavored with either mustard powder or mustard oil. If using oil, use the highest quality available, or expel your own. If using powder, grind your own fresh from the seeds. The sweetness of the fruit and syrup balances the spiciness of the mustard, making an excellent condiment to serve alongside rice, savouries or breads, or even served alongside raita for a beautiful color contrast.